A couple of days ago, as I was scanning news headlines, I saw that Seattle had failed to pass $15 + minimum wage. That's a lot of money for unskilled labor. Now, I don't know what the cost of living is up in the northwestern states, but I suspect it's getting to be pretty salty. If the cost of living is high the minimum wage tends to be high. The two are fairly inseparable, so if one goes up the other follows. You can't have a low cost of living and a high minimum wage because there's not enough revenue to cover the payroll expense. To put it more simply, if you're running a McDonald's and you're paying your associates $15 an hour, you will need to sell a hell of a lot of burgers, or you're going to need to raise the cost of the burgers you sell. Inevitably, it's the cost which goes up since only a certain percentage of the population is going to be buying burgers. This is true everywhere and not just for fast food restaurants. Funny how those states with out a minimum wage law or have minimum wage lower then the Federal Minimum Wage Law are major Tea Party States. The economy depends upon unskilled laborers doing the jobs nobody else wants to do at a barely survivable rate of pay. This is how it has always been and always will be. People may think this cruel, but if you want higher rate of pay then learn a skill or trade. Don't come to me and whine about how little you're getting paid when the trade off for your getting a higher minimum wage is for me to be paying higher bills. I know some might find it surprising, but the number of people getting minimum pay directly effects what utilities can charge. If the base pay for a region goes up $4 an hour the disposable income of those living within that region goes up as well, which means utilities can charge more without creating a 'burden.' And it's not just utilities, the same is true with every retailer out there; everybody wants a piece of that pie. 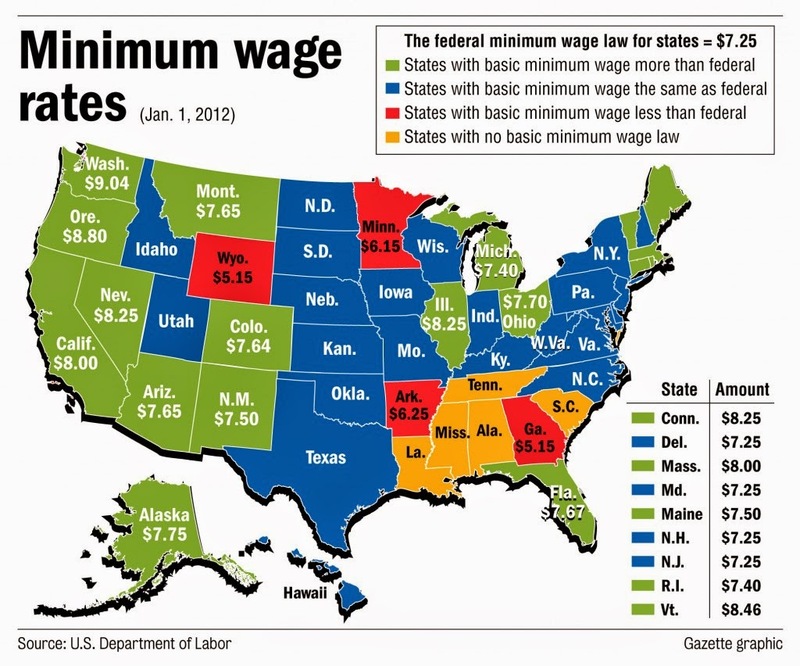 Oh, and for those who think that when the minimum wage increases, everybody else's rate of pay goes up too, forget it. It doesn't happen. Ever. What you end up with is a lot more people with a lower standard of living. Now, I have no problem with the minimum wage going up, but it needs to be done in small increments, over time. Just don't expect me to take a financial hit because unskilled labor wants it now. This is not Utopia... this is the real world.